John Watson misses the horses. Have you ever tried to trace your family tree? If so, you’ve probably been surprised to realize how very quickly generations of your family reach “History Book Land.” For example, if I pull up my father’s branches and count five generations back, I’m in pre-Civil War territory. This was not a very long-lived generation for some reason; however, one individual lived from 1858 until 1942. When he was born–in our area, at least–there was no indoor plumbing. No cars. No refrigeration. No electric lights–and no gas lights, either. By the time he died, we had all of those things and life had mechanized to a once unimaginable degree. Clothing, music, and mores had undergone incredible changes We had fought one world war and were in the midst of another. At least one of his children would live to see the birth of the atomic age, and watch a man walk on the moon. Arthur Conan Doyle lived in this same age of change, and because of the serial nature of his detective stories, so did Sherlock Holmes and John Watson. In “The Adventure of the Blue Carbuncle,” Mr. Henry Baker hasn’t even got gas laid on in his home–he relies on spermaceti candles. But fast forward to “The Adventure of Charles Augustus Milverton” and Sherlockians are dating the story by the sound the electric light makes as Milverton switches it on. When we meet Holmes and Watson, they’re hailing horse-drawn hansoms. 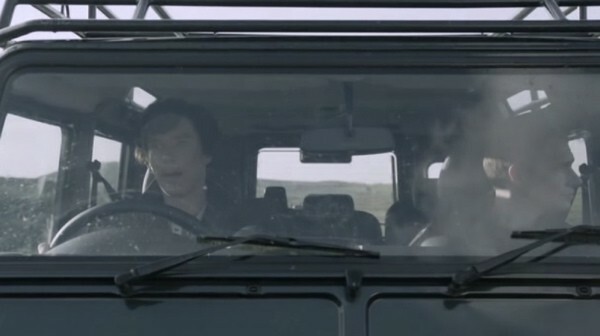 When we leave them, Watson is driving a Ford. 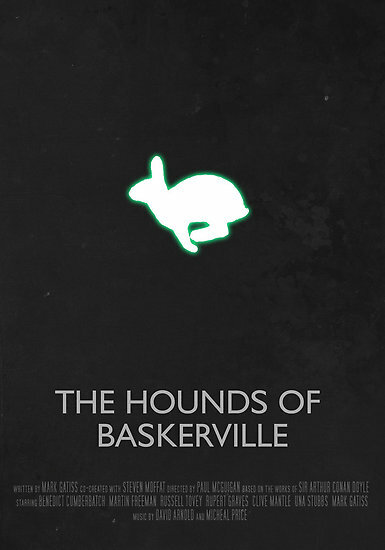 That’s not the only thing glowing at Baskerville. Let me know via the blog comments section, FaceBook PM or Twitter DM! Correct answers go into the hat for the chance to win one of two prizes. John wishes he could read. First choice is the book I loved best in 2013–and my favorite pastiche ever–so far. 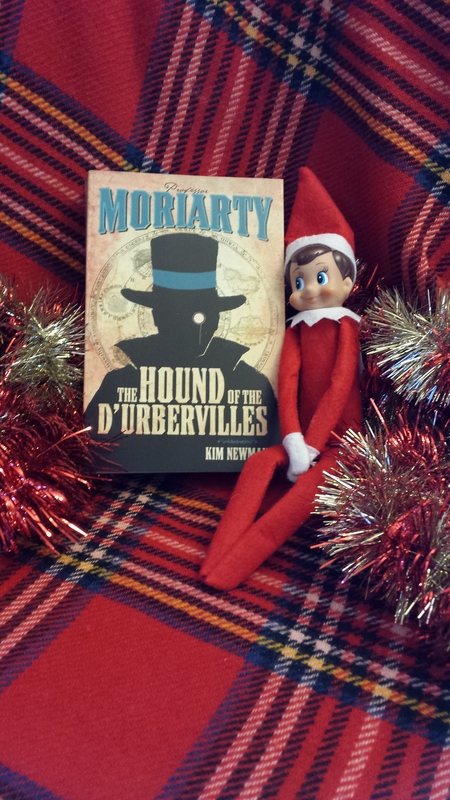 Kim Newman’s Moriarty is fast-moving, clever, funny–and suddenly gut-wrenching. Forget pastiche–it’s one of my all-time favorite books, period. 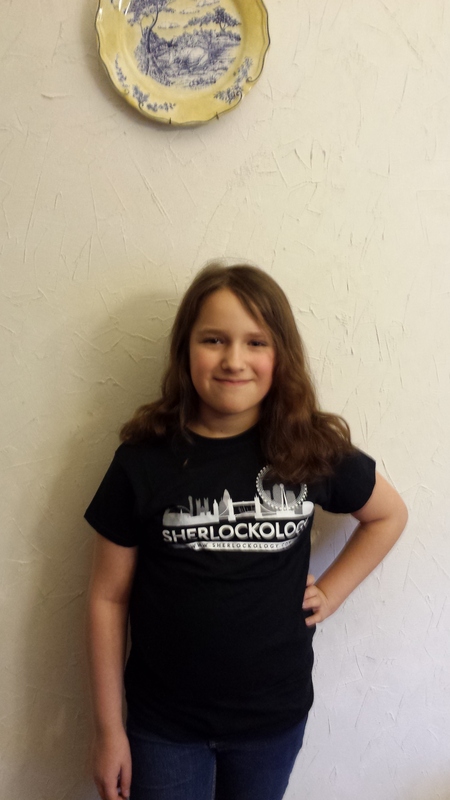 The second prize option is a Sherlockology t-shirt, modeled here by my daughter. Sizes run small (my daughter is very petite and wearing an S), so please feel free to PM me if you have any questions. Well–there you go! Send me your answers, the prize you’d like to try for, and we’ll see you back here tomorrow for Day 7! Well, I had several answers from people who are just playing the game, and one who is eligible to win. Congratulations, therefore, to James O’Leary, who pointed out the wicked physicians, Dr. William Palmer and Dr. Edward Pritchard, both executed for multiple murders by poison. Holmes mentions them as examples of doctors who have gone wrong as he and Watson travel to Stoke Moran to stop an even cleverer one in “The Adventure of the Speckled Band.” Kudos are due to Lexi Ulrich, who chose the true life murder of James Carey at the hands of Patrick O’Donnell, which Conan Doyle echoes in that of John Douglas in The Valley of Fear. In her answer (also deserving of kudos), Claire Daines mentioned Alphonse Bertillon, the expert in anthropometry whose testimony as a handwriting expert (which he was not) resulted in the unjust conviction of Alfred Dreyfus for treason. There are at least two pastiches in which Holmes is brought into that case; perhaps one day I will have the chance to review them here! Trying for Hound of the D’Ubervilles! “Swan” is Sir Joseph Wilson Swan, an English physicist and chemist who invented an incandescent lightbulb. Edison tried to take over his patent and Swan let him have the rights in the U.S. while retaining them in Britain. In 1883, they formed the Edison & Swan United Electric Light Company, more commonly known as Ediswan—which would be the exact company Sir Henry was talking about, even if he got the name turned around! Hello, Joseph Swan, a British scientist and inventor, invented an incandescent light bulb in 1860, 20 years before Thomas Edison. ( Edison’s bulb lasted longer and could be used individually which made it the more popular so he became famous as the inventor, at least in America) He had the first house lit entirely by electricity and was responsible for the first public building lit by electric light, the Savoy Theater in London. He also did work with nitrocellulose fibers and photography. Although the two did not work together, the two companies did merge. I would like to win the Moriarty book if I am that lucky…..I am a large person and the shirt would never fit me. 🙂 Plus I’ve been interested in that book for some time and have never read it. Sir Joseph Wilson Swan was the inventor of the incandescent light bulb. Thomas Alva Edison work independently but at the same time on the light bulb. When Edison got his American patent on his version on Swan’s bulb, he claimed that he was the true inventor. Swan retained the rights for the bulb in Britain. Swan and Edison’s two separate companies merged in 1883. Child Labor!!! Okay, time to pay the child the that model the T shirt a living wage!!!! Perhaps if she cleaned her room….